Random Film of the Week: “X”- The Man With The X-Ray Eyes | "DESTROY ALL FANBOYS!" Granted, for a short while it looks as if Ray Milland’s character Dr. James Xavier is going to be some sort of medical hero thanks to the experimental eye drops he’s created that allow him to see through first clothing, than human skin. Now, he’s no oddball pervert, but a doctor looking to enhance his vision for… SCIENCE! Of course, this being a Corman pic and all, science goes straight to hell in a hand basket with the rope cut as Xavier’s vision ends up getting TOO good to the point where he can see through his closed eyes and soon enough, a wicked pair of black shades that make him look like an aged Cyclops from the X-Men. Who just so happens to be getting more unbalanced by the minute as his eyes start seeing a LOT more than any human ever has. The film dips into comic relief briefly and early on with a funny party scene where Xavier gets a good look-see at people in their birthday suits doing the Twist, but other than that, it plays everything seriously. This turns out to be the second biggest shock in the film, especially when Don Rickles (!) turns up as a shady carny guy who crosses paths with and tries to exploit Xavier’s talents when the formerly good doctor ends up working in a carnival sideshow as an all too real (but still fake) “clairvoyant” names Mentalo after he’s forced into hiding. A few snarky comments aside, Rickles plays his part one hundred percent straight and actually makes a mighty fine dramatic actor here, making me wonder how his career would have gone had he done more work like this. Granted, he’s a much better comedian and the world is a funnier place with him in it. When it’s not falling to pieces, that is. Speaking of falling to pieces, as Xavier’s eyes expand his vision past the distance of the galaxy and into deeper space (and beyond), his mental state deteriorates because he’s seeing what no man should see and it overwhelms him to the very end. And in this film it ends in a fundamentalist revival tent with a fire and brimstone preacher urging Xavier with a famous biblical verse to do something the former good doctor takes literally. It’s still a shocking ending that pushes this right over the cliff from sci-fi to pure horror, but thankfully, it’s a quick shot that’s followed up by some haunting end titles. For me, this is Corman as his best – directing something that’s silly on paper, but pretty powerful on film when all is said and done. 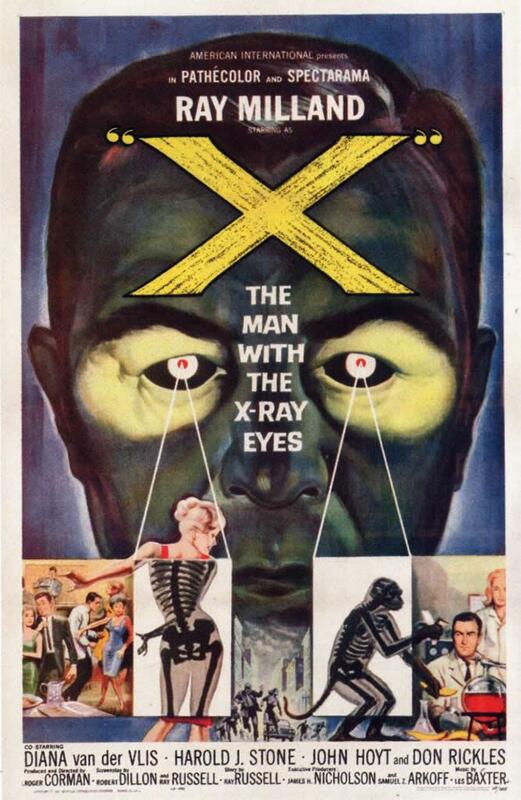 This entry was posted in DAF, Updates and tagged "X"- The Man With The X-Ray Eyes, 1963, 2013, AIP, American International Pictures, Commentary, Horror, Horror Films, Humor, Movie Posters, Movie Trailers, Movies, Random Films, Sci-Fi, YouTube by geelw. Bookmark the permalink. Pingback: Goodbye, Mr. Warmth | "DESTROY ALL FANBOYS!"